Tsavo-East is one of Kenya's oldest and largest National Parks covering almost 40% of the total area of Kenya's National Parks. 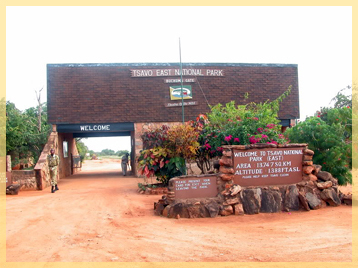 The combined area of Tsavo East and West form one of the world's largest game reserves- 13,000 sq. km. practically all of Kenya's wildlife is represented in the two Tsavo parks, with generous portions of elephant herds. Its beautiful landscape and proximity to the coast make it a popular safari destination. It is accredited as one of the world's leading biodiversity strongholds, bushy grassland and open plains alternate with semi-arid acacia scrub and woodlands. Green swathes cross the park where the river banks give raise to lush vegetation. North of Galana is a true wilderness. A number of leading tour guides offer private safaris across this area, camel safaris are a feature. Tsavo-East is recommended for photographers with its fabulous light and unbelievable views, in particular the Mudanda Rock and the Yatta Plateau, the world's largest lava flow. Lugard Fall on the Galana River are remarkable for the shaped water-worn rocks. Game includes: elephant, rhino, lion, leopard, crocodile, waterbuck, kudu, gerenuk and zebra and Hunter's Hartebeest can be seen with its lyre-shaped horns. Home to some of the largest herds in Kenya, the elephants glow red after dust baths, blowing the vivid red dust through their trunks over their bodies. Some 500 bird species have been recorded in the area, including ostrich and some migratory kestrels, while buzzards stop at Tsavo-East during their long flight south. The vegetation around Tsavo East National Park is savannah grassland with thorny bushes and some swampy marshland near Voi River. The landscape is unique because of the Yatta Plateau formed from the lava that oozed from Ol Doinyo Sabuk Mountain. The main river that passes through this park is the River Galana. A variety of animals can be seen: lions, leopard, cheetah, zebras, giraffes, serval, antelopes, kongoni, lesser kudu, oryx, klipspringer, impala, stripped hyena, gazelles, buffalos, and elephants. A variety of migratory and native birds are seen. The birds are viewed between late October and early January, and come from as far as Eastern and Western Europe. Commonly seen birds are African skimmers, goshawks, red and yellow bishops, palm nut vultures and the white-headed buffalo weavers. Some places of interest near the park are: Lugard Falls named after Lord Lugard, who volunteered for the British Diplomatic Services in East Africa. Crocodile Point on the Galana River. Mudanda Rock, a 2 mile stretch of an Ayers type of rock, which acts as a water catchment area supplying water to the dam below. Large numbers of Elephants congregate there during the dry season.